[195 Pages] The global ink resin market, along with its applications, has witnessed a moderate growth for the past few years and this growth is estimated to increase in the coming years. The properties such as solvency, good flow, resin stability, dilutability, remarkable gloss, and provides good surface appearance and ink performance will be the key influencing factors for the global ink resins with an increased emphasis on its different applications and their ink resins types. The global market value of the ink resin is projected to reach $3,461.61 million by 2019. The ink resins market is experiencing moderate growth which is expected to continue in the near future, mainly driven by the highly growing Asia-Pacific, and RoW regions. Moderate amount of mergers and acqisitions are made by different market players to serve the applications in the future. The Asia-Pacific region is the major market that accounted for about 46.45% market demand by volume of the total global demand in 2013. More than 8.78% of the total ink resins demand was consumed by the corrugated cardboard & folding cartons application in the ink resins industry in 2013. The growth of the flexible packaging applications is also driving the growth for ink resins.The drivers of the ink resins industry are improved supply of raw materials for ink resins, growth of packaging and energy curable inks, long term strategic partnerships of ink resin suppliers with ink manufacturers, environmental protection legislations, and new ink resin technologies. The demand for flexible packaging is increasing in China, which is one of drivers for the ink resins market in Asia-Pacific. This study basically aims to estimate the global market of ink resin for 2014 and to project its demand by 2019. This market research study provides a detailed qualitative and quantitative analysis of the global ink resins market. We have used various secondary sources such as directories, industry journals, and databases to identify and collect information useful for this extensive commercial study of the market. The primary sources–experts from related industries and suppliers–have been interviewed to obtain and verify critical information as well as to assess the future prospects of ink resins. The global ink resin market has been covered in detail in this report. In order to provide an all-round picture, the current market demand and forecasts have also been included. The ink resins market is estimated to reach 1,082.44 kilotons by volume by 2019, signifying a firm CAGR of over 3.43% between 2014 and 2019. The global market of ink resins, along with its applications, showed a moderate growth in the past few years and is estimated to continue in the coming years. An increase in the demand in flexible packaging, folding cartons, corrugated cardboard, promotion, and other applications will be the key influencing factors for the global ink resins market. The demand for online shopping is increasing in the emerging countries and lables, plastic bags and invoice are used for packaging which eventually drive the printing ink market. The steady rise of digital media has shrunk the print media market by which many players have shifted at least half of their marketing spending from traditional to digital advertising over the last few years. More than 58% of the total ink resins demand was for the printing & publication application in 2013, with flexible packaging demand being the second largest application. The North America and the Europe regions are the most active markets in terms of strategic initiatives, owing to their market demands. The flexible packaging application has led the rapid growth in the ink resins market. The significant ink resins manufacturers include Arakawa Chemical (Japan), Arizona Chemical (U.S.), BASF SE (Germany), Evonik Tego Chemie GmbH (Germany), Hydrite Chemical (U.S.), IGM Resins (Netherlands), Indulor (Germany), Lawter B.V. (U.S.), Royal DSM N.V. (Netherlands), and The Dow Chemical Company (U.S.), and other local players. This report covers the ink resin market by key regions and important countries in each of these regions. 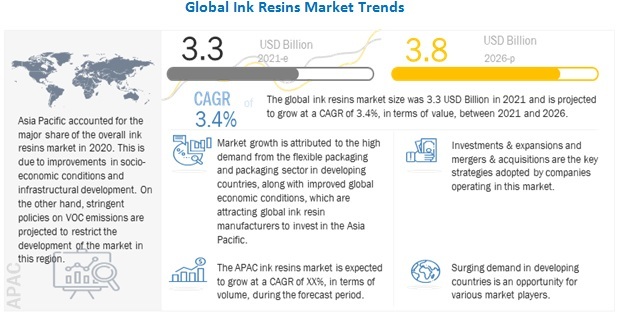 It also provides a detailed segmentation of the ink resins market on the basis of different types, technology, alongwith their key applications upto 2019.